Steve Marshburn ’01 plays his favorite sport. At age 5, I picked up my first tennis racket. Growing up, I was active in many different sports, but when I hit ninth grade, I started focusing solely on tennis and never looked back. To this day, this sport is my passion and I play as much as I can. Born and raised in Redlands, I was familiar with the deep heritage of the University’s tennis program and legendary Coach Jim Verdieck—not only his championship records, but also the culture he fostered. Both my parents attended Redlands, so the opportunity to play tennis as a legacy at U of R was an enticing possibility. In-fact, I often remember visiting Verdieck Courts when I was in middle school and high school to watch the Bulldogs compete. When I did join the University’s tennis program in 1998, I felt grateful to be part of such a tradition. I had the pleasure of playing under both Coaches Jim Ducey and Geoff Roche, and they carried on Verdieck’s legacy in their own ways, helping us understand that what mattered was not only winning, but also the type of players, competitors, and people that we needed to be. I was proud to be part of the Bulldog tennis team! We were ranked as high as number three in the country and won the SCIAC [Southern California Intercollegiate Athletic Conference] championship every year I was there. We also had a lot of success in the classroom—many of my teammates were Academic All-Americans, earning high GPAs. I give a lot of credit to the coaches and the athletics department for fostering success in competition, but never at the expense of academics. In my senior year, we were playing the third-place match at the national championships against Gustavus Adolphus College in Minnesota. I knew it was my last team match at Redlands, and I can still picture in my mind our entire team, along with our coaching staff and fans who had traveled so far to support us, out there cheering as the last match was playing. The overwhelming support showed how much we were like a family, and that victory was the perfect ending to one of the best parts of my life. As student-athletes, we looked forward to the annual Tennis Alumni Weekend. As an alumnus, I have not missed one since 2009. 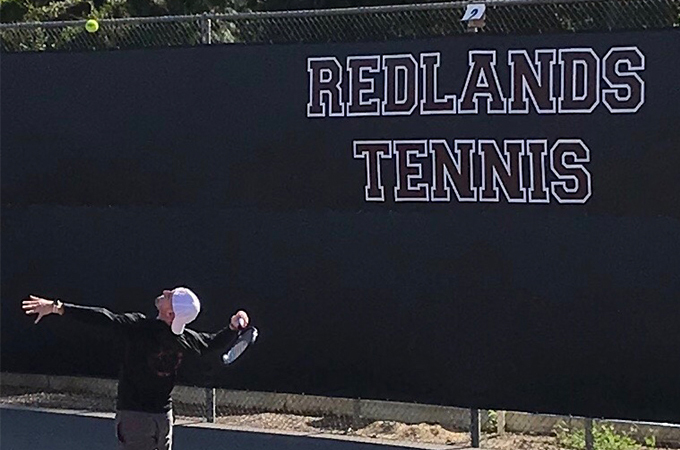 The weekend is a touchpoint that allows me to stay connected with the Bulldog tennis program and to form deep connections with alumni who went to Redlands before or after I graduated. When I heard about the plans for the tennis complex at the last Tennis Alumni Weekend last month, I was excited! Verdieck Courts are special for me, but frankly resurfacing each year is not enough. These plans address what we need and will be a huge improvement over what we currently have. They are another way to maintain that Bulldog tennis legacy, appealing to today’s 17-year-olds as they are being recruited to play college sports. Within the student-athlete community (especially our tennis family), we care about the success of the University today: it is not only about what happened when we were students, but what we are doing to stay competitive and successful into the future. For alumni who treasure their time and relationships at Redlands, I believe it is important to stay involved to ensure the legacy lives on. The annual Tennis Alumni Weekend brings together Bulldogs across the generations. To learn more about the plans for the tennis complex or to get involved, visit http://foreveryours.redlands.edu/bulldog-athletics/ or contact Ericka Smith at ericka_smith@redlands.edu or 909-748-8357.